Panama President Juan Carlos Varela, left, shakes hands with Japanese Prime Minister Shinzo Abe during their joint press remarks at Abe's official residence in Tokyo, April 4, 2019. Japan’s efforts to boost Latin American connectivity featured during President Juan Carlos Varela’s visit to Tokyo. Japan praised Panama’s decision to proceed with construction of a transport project based on Japanese monorail technology as leaders of the two countries met in Tokyo to strengthen bilateral ties. Tokyo’s support for the monorail project comes as a time when Beijing is also vying for influence in the Central American country. Panama cut diplomatic ties with Taiwan in 2017 and has since expressed enthusiasm for Chinese President Xi Jinping’s flagship Belt and Road initiative. 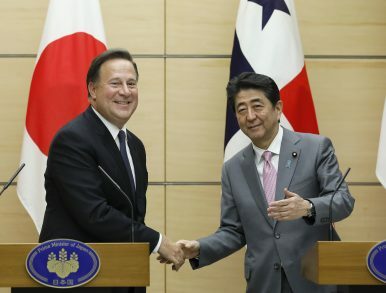 Panama’s president, Juan Carlos Varela, visited Tokyo for talks with Japanese Prime Minister Shinzo Abe and other senior officials on April 4, three years after his previous trip to the Japan’s capital. Abe argued that economic relations between Japan and Panama “constitute a model for Japan’s efforts to enhance connectivity with Latin America and the Caribbean in a multifaceted manner,” according to a summary issued by the Japanese government. Abe added that Japan intended to work with Panama as a partner across the Pacific Ocean based on their shared values. The leaders discussed progress on the Panama Metro Line 3 project, which Tokyo is helping to build with an Overseas Development Assistance (ODA) loan. According to the government summary, the monorail system will connect the western side of the metropolitan area of Panama and downtown Panama City, with the aim of improving transport links and reducing greenhouse gas emissions. The project is underpinned by a loan from Japan totaling 281 billion yen ($2.5 billion), for which notes were exchanged during a previous meeting. The Japanese government says this is Tokyo’s largest ever ODA loan for Latin America and the Caribbean. Last year, the Japanese companies Hitachi and Mitsubishi signed a contract with the operators of the Panama Metro relating to the monorail cars and system. Varela replied that he “welcomed the fact that many Japanese companies have [been] operating in Panama, and stated that they would like to continue working for the efficient and economical operation of the Panama Canal.” He thanked Japan for providing assistance toward several projects, which also include the Panama Bay Purification Plan and the Panama Canal Expansion Project. Varela was due to inspect a railway vehicle manufacturing plant in Yamaguchi Prefecture the day after the summit meeting. Varela’s visit to Japan comes as China also seeks to bolster its influence in Panama. China’s efforts appear to have yielded tangible results, with Panama switching its diplomatic recognition from Taiwan to Beijing in June 2017. Since then, Chinese companies have sped up their investments, including a $1 billion expansion to Margarita Port near the Panama Canal. Varela spoke positively about the Belt and Road initiative during a stop in Hong Kong prior to his Tokyo visit, saying it was “a big opportunity to connect Asia and America to Panama.” He is reportedly due to attend a Belt and Road forum in Beijing later this month. Once again, Japan expresses a vague, and double-edged, interest in the Belt and Road. In Japan, Trump and Abe Offer Alternative to China’s ‘Belt and Road’Panama Switch Marks China's Return to Checkbook DiplomacyTaiwan Loses Another Ally as Panama Embraces ChinaUS-Japan Trade Agreement Negotiations: Why Now?Is Japan Anti-China?